Please sign our petition to complete the line from Oxford to Cambridge - click on the button below. If you have registered previously and your personal details have changed then please email oxcam@railfuture.org.uk with your name and details to be updated. In future we will be providing a 'self-care' facility to amend these details on the website. There was long-expected, though still exciting, news on Monday 28 January 2019 that moves Railfuture's 30-year Oxford-Cambridge rail campaign a step closer. That was when the government's East West Railway Company announced a six-week consultation beginning immediately on five possible routes (see image below) for the new railway linking Bedford with Cambridge. Cambourne appears on two of the proposals with the other three are via Bassingbourn with new or relocated stations between Bedford and Cambridge. 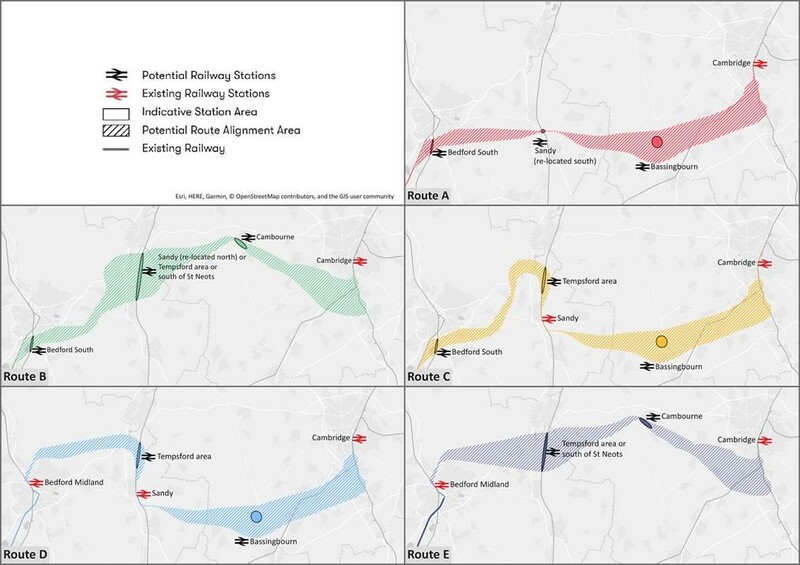 All five routes have something crucial in common - they would all come into Cambridge from the south, serving the proposed Cambridge South station (a Railfuture top priority) and being able to continue to Ipswich without a reversal at Cambridge. Many had expected a single preferred route to be announced, but a prudent approach is being taken to demonstrate public support. The consultation ended on 11 March 2019 (see https://eastwestrail.co.uk/haveyoursay. for information about the prcoess). Railfuture submitted a four-page response (PDF 140kB), in which we said that option 'A' (top right image above) had the greatest advantages, in our view, with a conpehensive explanation of why Railfuture came to that conclusion. Older news: Network Rail (NR) submitted a Transport & Works Act (TWA) Application on Friday 27 July 2018 to allow it to undertake construction to reopen the western section betweeen Bicester and Bletchley (and other works on the line towards Bedford). This triggered a statutory objection period (ended 7 September 2018) in which people could object and, more importantly for supporters, to write in support of the scheme. The email address for any enquiries or updates to submissions is transportandworksact at dft.gsi.gov.uk. Naturally Railfuture submitted a response to the Department for Transport in full support of the scheme. It can be read HERE. This was followed on 18 October 2018 by Railfuture's Statement of Case (HERE) to support its evidence at the public inquiry, which begins on Wednesday, 6th February 2019 at the MK Community Foundation Conference & Training Facilities, Margaret Powell House, 433C Midsummer Boulevard, Milton Keynes MK9 3BN. A dedicated website has been published for the Public Inquiry at http://bicester-bedford.persona-pi.com. During the consultation period, Councillor Mark Shaw, Chairman of the East West Rail Consortium of councils, which has campaigned for the reopening of the Varsity Line since 1995, said: "I'd really encourage people to give their views directly to the Department for Transport and leave them in no doubt about the public's appetite for getting trains on tracks as soon as possible.". Railfuture echoes this, and urges as many supportive responses as possible. The documents are available at https://www.networkrail.co.uk/our-railway-upgrade-plan/key-projects/east-west-rail/western-section/ and a CD of the documents can be ordered from NR for £5. The consortium has some easy-to-read pages about the TWA application at https://www.eastwestrail.org.uk/transport-and-works-act-order-twao/. Railfuture has been told that the final number of letters of support for the project was 411. The total number of 'objections' (typically concerning one small aspect of the route [90 about a crossing at Woburn Sands and some others about crossings, such as Lidlington, footpaths and potential noise] rather than the scheme itself) was 234. Apparently this is the highest ratio in favour of a TWA Order project in Network Rail's experience and it has expressed thanks for those who had mobilised this level of support. Crucially there were no 'significant' objections from any local authorities. More information about progress will be provided during the period of the Public Inquiry. After the public inquiry ends the inspector has to write up a report for the Secretary of State, who then has six months to decide whether to grant it or not. This could potentially be December 2019 - although Network Rail hopes to receive the Transport and Works Act Order in September 2019 - after which there is a statutory six-week objection period, meaning that construction work requiring the TWA powers will not commence until at least late 2019, although that would not prevent preparation works on operational railway land from being performed earlier. Network Rail is continuing with design work. The 'GRIP4' process should be complete in March 2019. A 'go/no go' decision on whether it should include the modern ETCS (train control) signalling system is still to be made by Network Rail. During his annual budget speech on 22 November 2017, the Chancellor of the Exchequer, Philip Hammond, confirmed that an estimated £1 billion of additional funding would be available for the delivery of phase 2 of the Western Section, which will link Oxford and Aylesbury to Bedford and Milton Keynes. Obtaining a TWA Order (as mentioned above) is essential to achieving this. An Alliance of Network Rail and key construction companies (Atkins, Laing O'Rourke and VolkerRail) has been formed to perform the work once powers are obtained. The upgrade and reinstated line could open in 2023 although 2024 is more likely. The East West Rail Company, which the Secretary of State for Transport, Chris Grayling, designated in late 2016 as the body to oversee the opening of a rail route between Bedford and Cambridge, was formally launched by Mr Grayling on 14 December 2017 when he also visited Bletchley Station and Bletchley Viaduct. The company is working towards deciding on the route of the railway, which is likely to go close to Sandy (although Railfuture believes a route further north at St Neots has considerable merit as discussed in its report [see pages 6 and 8] to Cambridegshire County coucillors in 2013). However, it is important that pressure is kept on the government and politicians to ensure that the best possible railway is built and in a reasonable timescale. An opening date around 2027 could be possible if there is the political will. Railfuture wants to see the new line electrified from day one. There is no cheaper way of doing it than as part of the initial construction. However, because of delayed and over-budget delivery of recent electrification schemes the government is not currently in favour of more electrification. This is something that must change and Railfuture continues to campaign on this, especially to ensure that the skills built up over decades that Britain lost in the early 1990s and had to expensively re-learn recently will not be lost a second time. Railfuture hopes that the completion of electrification of the TransPenine Route Upgrade, which Mr Grayling confirmed in July 2018 will take place, could see the teams transfer onto East West Rail. The Department for Transport has agreed with Network Rail that the new Cambridge South station (which would serve Addenbrooke's Hospital and the biometric campus) will be opened as a four-platform station with the railway doubled from two to four tracks between Cambridge station and Shrepreth Branch Junction (where the Liverpool Street and King's Cross lines diverge) ultimately allowing capacity for six trains per hour between Bedford and Cambridge. Railfuture is eager for services to the east of Cambridge to be planned from day one so that there will be direct services through Cambridge to Ipswich and Norwich. The Ox-Cam link will deliver substantial cross-region benefits. The upgraded link between Oxford station and Oxford Parkway opened to passengers on Sunday 11th December 2016, with an opening ceremony performed by the Secretary of State for Transport, Chris Grayling, on Monday 12th December. The track-work had been completed almost three months earlier, on 21 September 2016, as Network Rail confirmed in a Press Release. First Oxford Parkway to Oxford train service (just 6 minutes versus bus link of 20 minutes) was at 08:44 on Sunday 11 December 2016. The train had started from London Marylebone and Railfuture representatives were on board it. Observers are sceptial that Cambridge-Bedford will be achieved by the "mid 2020s" but that is the official government position and Railfuture intends to hold them to it and expect it to be open within a decade. UPDATE - See Railfuture Central Section photos about the Cambridge-Bedford route, uploaded in April 2016, and Western Section photos about the completion of the Oxford-Oxford Parkway route, uploaded in September 2016, which opened to the public on Sunday 11th December 2016 as a 'trial' day with the full service commencing the following day. Help us continue to Cambridge by contacting your MP. You can send our 'postcard' (PDF 34kB) to them. Spread the message and get as many other people as possible to do like-wise. You could either send them an email with the address of this web page, or print the leaflet (below) and postcard and give it to your friends. Many thanks. Railfuture held its national conference in Oxford on 2nd November 2013, which included a presentation about the Ox-Cam link from Patrick O'Sullivan of the East West Rail Consortium. Railfuture also held a conference in Cambridge on 22nd June 2014, when nearly all of the speakers (including two representatives from Cambridgeshire County Council, which is leading on the Cambridge-Bedford section) mentioned the Ox-Cam link in their presentations. This clearly shows how important the rail link. On 21st May 2016 Railfuture held its national AGM in Milton Keynes. The main speaker was Iain Stewart, MP for Milton Keynes South, who talked about East West Rail and how vital it is. There was also a presentation about the Borders Railway that reopened in September 2015, which serves a much lower population. It took only five years from final approval to opening to the public. Ox-Cam mini-site developed with assistance from www.billingspecialists.co.uk. Page last changed on 12th March 2019.